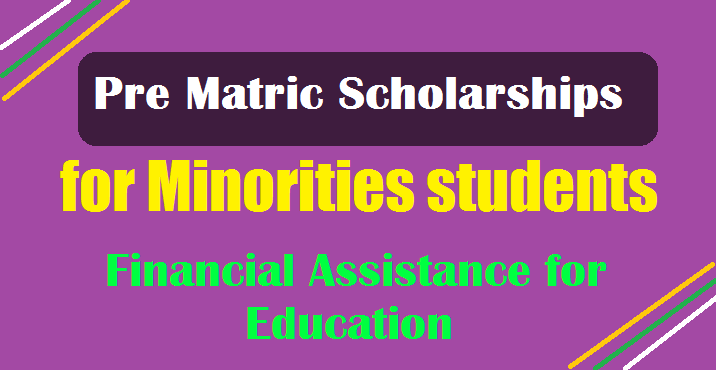 GoI Pre matric Scholarships for Minority students 2018 apply online @ scholarships.gov.in . Scholarships offered by the central government to minority students. The Organization said that, Eligible students may apply for the Pre Matric scholarships. The Last date for online applying for scholarship is September 30, and it is required to apply for renewals by September 30. Qualified Minority Students have suggested to apply in the National Scholarship Portal scholarships.gov.in . Application deadline is September 30. Eligibility criteria, How to apply online, Scholorship amount, payment process, required documents to apply, renewal preocess, selection procedure and more details are available in this page. (i) Scholarship will be available to the students of minority community studying in Classes I to X. (iv) The continuance of award (for Renewal applicants) will be subject to securing 50% marks in the previous years examination. (x) If a student is found to have obtained a scholarship by false statement, his/her scholarship will be cancelled forthwith and the amount of the scholarship paid will be recovered by the concerned State/UT Govt. (xi) The course/tuition fees and maintenance allowance will be credited to the student’s bank account directly under Direct Benefit Transfer (DBT) mode. (xii) The student obtaining benefits under this scheme shall not be allowed to avail of benefits under any other scheme for this purpose. (xiii) A student shall be eligible for only one scholarship out of all the available Scholarships of Central Government meant for SC/ST/OBC/minority. (xiv) The amount of Administrative Expenses (@ 1%) for States/UTs in subsequent year shall be released after receiving the Utilization Certificate for the previous years. (xv) The scheme will be evaluated at regular intervals by the Ministry or any other agency designated by the Ministry and the cost of the evaluation will be borne by the Ministry of Minority Affairs under the provision of the scheme. (xvi) The State/Union Territory shall place all relevant details of financial and physical achievements on their website. (xvii) The regulations can be changed at any time at the discretion of the Government of India. (xviii) It will be necessary for the eligible applicants to provide Aadhaar number while applying for the scholarship and in case, an individual does not possess Aadhaar one can provide the details of alternative identification documents, as stated in the Gazette Notification- S.O. No. 1284 (E) No. 1137, dated 21.04.2017 (as per Appendix-C). (xix) Students who have entered Aadhaar in their online application correctly and Aadhaar seeded with any of their bank account, in such cases the amount of scholarship will be credited to Aadhaar seeded bank account only (though student has mentioned any other non-seeded bank account in online application). skilled personnel right from the beginning to ensure that the data based computerized systems are operational. Qualified skilled personnel possessing requisite expertise to operate computer programme designed for this purpose, enter, process, analyse, monitor, retrieve and transfer data should be engaged on contract basis as per need. mandatory for all students to apply online on the website i.e. www.scholarships.gov.in. The scheme is Central Sector Scheme and 100% funding is provided by the Ministry of Minority Affairs. The State/Union Territory shall maintain year-wise details of the students receiving scholarship, indicating school/institute, location of school/institute, government or private, class, gender, new or renewal, permanent address and parents’ address. The States/ Union Territories shall place relevant physical and financial details in their official website. will not be transferred even though the application is approved for scholarship). (v) Bank Account must be operational/active till the scholarship is disbursed. (vi) Bank Account must be preferably in any scheduled Bank with core banking facility and proper IFS Code. (vii) Bank Account must be in the name of either the student or a joint account of student with either mother or father or a legal guardian only. 20. MODIFICATION (if any, during 2017-18 to 2019-20) Minor modifications, if any, in the scheme having no financial implications may be made by the Competent Authority in the Ministry of Minority Affairs without seeking recourse to SFC/EFC/Cabinet. However, Ministry of Finance, Department of Expenditure would be consulted.